It’s October and so much of the year has already gone by. Too many wasted moments. Too many dashes out of the door. Too many hugs not given. Too many words left unspoken. And far too many special moments that should have been savoured, I’ve let slip by. So here’s what I’m doing right here, right now. I’m setting aside time to be thankful. I am thankful to live in a country wherein the freedom to be Catholic exists. Not all of us are as blessed. Being from a Muslim country, I have sadly borne witness to this on a personal level, numerous times. I am thankful for the kisses my daughter gives me each morning before she heads off to boot camp aka high school. I dread the day when university beckons, and I am no longer able to reach out, hug her, tell her I love her. Be physically there for her. I am thankful to have been nurtured in an environment wherein hugs and physical demonstrations of love were always encouraged. In turn, I am able to pass that on to my family. I am thankful for my first job abroad. Alone for the very time in my life, with very little money, there were days when dinner was a slice of bread and nothing more. That time changed me. It made me street smart. It made strong. I am thankful for being afraid every now and again. Fear forces me to look within myself. To understand what’s going on. Why I acted the way I did. And come out of it, aware. Without fear, I would never venture beyond self-imposed boundaries. I am thankful for all the horrid and not so nice people whom I have met. Because of the way you talk, act, and think, I know exactly what sort of person I do not ever want to be. I am thankful for each and every single dysfunctional relationship in my past. Without experiencing them then, I would never have learned to recognise the glint of real gold today. I would still be placing superficiality and material things on a pedestal. He is the crunch to my bacon. He is the sweet to my Milo. I am thankful for being alive. Ohhh, the way you talk (write) about your husband makes my heart melt 🙂 I can feel the love! 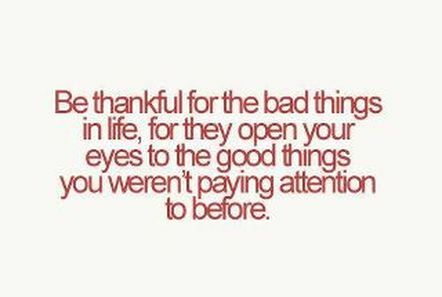 There certainly are a lot of wonderful things we have to be thankful for. Every day is a miracle!